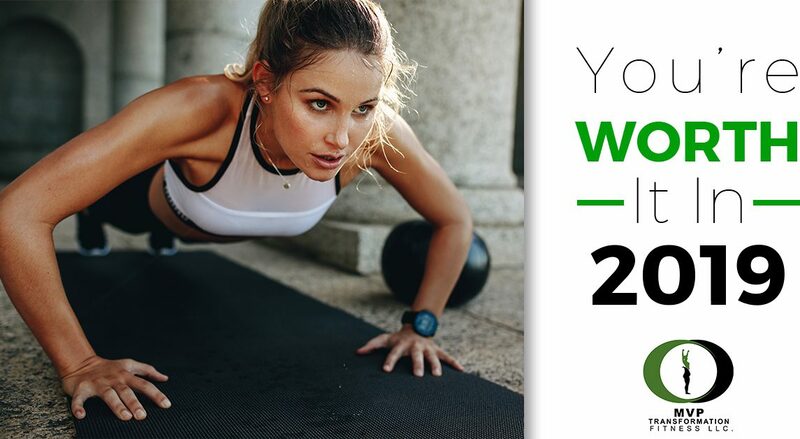 Fitness Center in Hutto, TX: You’re Worth it in 2019! The New Year brings a renewed hope for the coming year as we look forward to improving many areas of our lives. The top New Year’s resolution is always to be healthier by losing weight or eating better. The sad fact is that by mid-February more than half of people have given up on this New Year’s resolution. MVP Transformation Fitness in Hutto, TX, does not want you to become just another statistic with high goals and fell flat. Join us today and we’ll help you achieve your health and wellness goals. Contact us today! Have an accountability partner. Aiming for a goal, especially one such as weight loss, is much harder to accomplish on your own. If you have a partner or someone to be accountable to for your health and wellness decisions, you are much more likely to succeed. MVP Transformation Fitness will be your accountability partner in your fitness goals. We offer nutrition guidance and coaching, personal training, and health coaching to help you on your fitness journey. Join us today! Make a plan. You can’t succeed by just joining a gym and then showing up and expecting to know what to do. You’ll need to decide what days you will train, for how long, and which activities you will do. If you’re unsure, MVP Transformation Fitness can help. We offer group fitness classes for you to see what you like. We offer strength training, martial arts-inspired classes, and yoga classes. We have something for everyone at MVP Transformation fitness, so try us today! Slow and steady wins the race. If you start out really hard and end up sore and in misery because you can’t walk up the stairs for three days, odds are, you will quit, especially if you’ve been mostly sedentary for a while. You have time to go all out at high-intensity multiple times a week like others you may see around you. Have faith that you will get there. So in the meantime, work your body up to that level. Three times a week is fine, and low-to moderate-intensity will be sufficient to elicit a great response and results. Set realistic goals. Many people quit their exercise routine because they think it’s not working when they don’t see results soon enough. Transforming your body and losing weight takes time. You’re not going to wake up one day and see a toned body and two inches gone. All of this takes time and if you quit, you’ll never see results or know what you’re capable of. Aiming to lose one pound every two weeks is realistic. Aiming to lose one pound every two days is not. MVP Transformation Fitness in Hutto, Texas, is here to support you, encourage you, and be your accountability partner, so you can finally accomplish your fitness goals. We understand the heartache and frustration trying to lose weight and get fit can be. It’s hard work — every step you take — but MVP Transformation Fitness is here to help you smash your fitness goals and finally get fit in 2019. You can obtain a free seven day pass on our website or show up to class to try us out. If you’re ready to join, you can join online. Either way, we’d love to embark on your fitness journey with you as your greatest cheerleader. Contact us today!